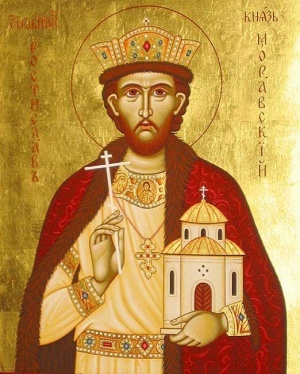 Our father among the saints and confessor Rastislav ("Rastic", in modern Czech Rostislav) of Moravia was the second prince of Great Moravia between 846 and 870. He was canonized in October 1994 by the Czech and Slovak Orthodox Church. His feast day is May 11 /24. After Mojmír's death in 846 Rastislav was designated by Eastern Francia king Louis the German to become the head of Great Moravia. He assumed that Rastislav will cooperate with him just as his predecessor had. After internal consolidation Rastislav tried to restrict polititical influence of Eastern Francia. In 855 Great Moravia was attacked by Louis' army. However, the attack was not successful. Eastern Francia was spreading it's influence through Frankish priests, who preached in Latin so in 862 Rastislav asked Byzantine emperor Michael III to send a bishop and teachers, who would bring the Gospel to the Slavic peoples in their own language. The emperor decided to send two wise men, the brothers Cyril and Methodius who laid the foundation of the Slavonic script (Glagolitic alphabet), and thus of Slavonic literature. In 864 Louis the German again attacked Rastislav. This time successfully. Rastislav was forced to recognize the supremacy of the Eastern Frankish Realm over his kingdom. In 870 after a growing disagreement between Rastislav and his nephew Svatopluk, the latter made a deal with Carloman of Bavaria (Louis' son) to exchange Rastislav for the promise that he will rule Great Moravia. Louis the German blinded Rastislav and jailed him in one of Bavarian monasteries, where he died in that same year. The form of his name ("rast-") is evidence for the fact that he was born somewhere in what is today central Slovakia. This page was last edited on April 5, 2016, at 01:06. This page has been accessed 19,860 times.